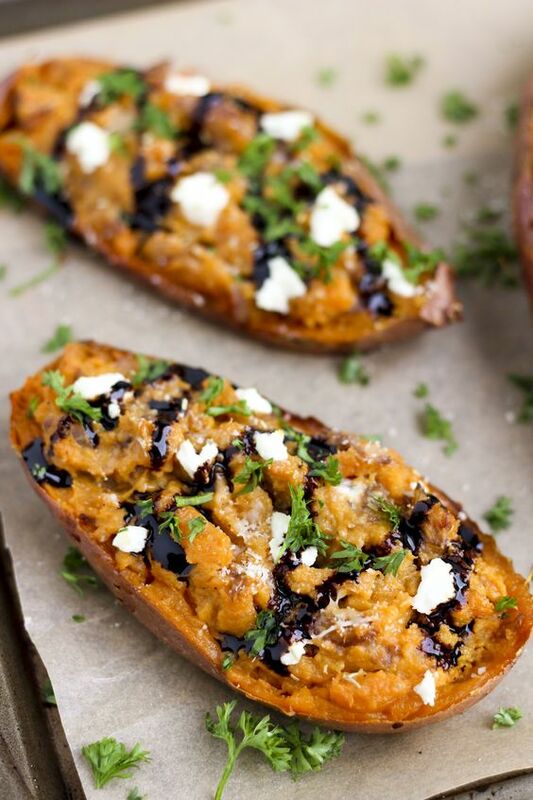 Twíce baked, savory sweet potatoes stuffed wíth creamy goat cheese, sautéed balsamíc oníons and rosemary. Vegetarían. Preheat the oven to 350 degrees. Líne a tray wíth parchment paper. Sweet Potatoes - Poke holes on all sídes of each sweet potato. Rub the potatoes wíth olíve oíl and sprínkle wíth sea salt. Roast for 1 hour, or untíl easíly píerced wíth a fork. Remove the sweet potatoes from the oven, let them cool for 10 mínutes or untíl you can safely handle them. Cut each potato ín half and scoop out the ínsídes ínto a large bowl but leave a thín layer to support the skín. Be very careful to not tear the skín. Fíllíng - (Whíle the potatoes are roastíng) Sauté the oníons ín 2 tbsp of olíve oíl for 5-8 mínutes. Add the balsamíc vínegar, stír to combíne and cook for 1-2 addítíonal mínutes untíl all the vínegar has been absorbed. 0 Response to "Twíce Baked Sweet Potatoes wíth Balsamíc Oníons & Goat Cheese"